File - A Barnes & Noble in Princeton, New Jersey. This could be the most crucial holiday season in Barnes & Noble's history. Its sales have been in a decline for six years as the bookseller cedes market share to Amazon and consumers turn to their phones or portable tablets instead of books. There's been a revolving door in the retailer's C-suite, and activist investors have piled on. Now, Barnes & Noble is considering a sale of its business after receiving interest from a handful of parties, including its founder and executive chairman, Leonard Riggio, and reportedly, U.K. retailer W.H. Smith. Barnes & Noble must prove it can deliver sales growth in its core book business this holiday season. The retail industry as a whole is expected to benefit from strong consumer spending, with the average American household expected to spend $1,536 through the holidays, according to a survey by Deloitte. That's up 25 percent from a year ago. 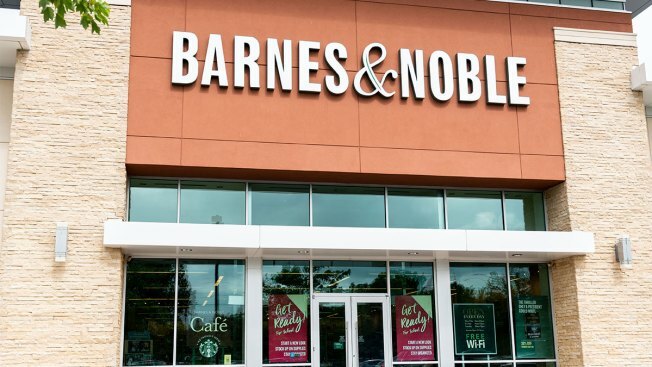 If Barnes & Noble can't grow sales against such a healthy, economic backdrop, the company could ultimately head down the same path as its former rival Borders, or shuttered Toys R Us or Sears , which is in bankruptcy court. All things considered, Barnes & Noble is feeling "highly anxious" and somewhat "paranoid" this holiday season, Riggio told CNBC. But it still has high hopes. "We've done a lot of things this year to try to put ourselves on the right track and to get our comp-store sales number to head in the positive direction, ... and we are hoping that that comes — we are planning for it to come — during this holiday season." The company will report its fiscal second-quarter earnings on Nov. 20, where it could say more about expectations for its holiday quarter. In September, without giving a specific range, Barnes & Noble said it expected "improving sales trends, positive comps during the holiday period, better gross margins, and continued expense reductions" for the remainder of the year. Analysts surveyed by Refinitiv predict same-store sales for fiscal second quarter will be down 1.75 percent, but then moderate in the holiday quarter, its fiscal third quarter ending Jan. 19, to drop only 0.25 percent. Last holiday season, the bookseller's sales tumbled more than 6 percent, with e-commerce sales also in the red. After the dismal results, the company slashed its staff. Now, it has a new plan in place for this year. In a new ad campaign that's being rolled out this week in movie theaters and on cable television, Barnes & Noble touts its more than 20,000 current employees, along with their knowledge of books, as reasons why its stores are unique. "Nobody Knows Books Like We Do" is the message of the campaign, which will run though the middle of January. Barnes & Noble also will be testing roughly 10 to 15 store layouts during the holidays, featuring different spreads of merchandise, to see what sticks. "We have a lot of things out there in test form," Riggio said. "Retail is all about that. ... If you're smart, you conduct tests during the holiday season, and that informs you how to run the next holiday." Within just the past five years, Barnes & Noble has lost more than $1 billion in market value. Its shares have fallen about 4 percent from a year ago, having spiked more recently on deal speculation, and now trade under $7. "To have a company with a small market cap is somewhat problematic," Riggio said. "Our market cap is an indicator that we should be a private business." Riggio, who is still is the retailer's biggest shareholder with a 19.2 percent stake, has tried to buy Barnes & Noble before, only to abort that effort. Even in 2013 — when Riggio was considering a plan to buy the retailer's stores but not its Nook business — Barnes & Noble's future was largely uncertain. Amazon all the while has managed to take almost 50 percent of new book sales, according to Codex Group, a book audience research firm. While it doesn't break out Barnes & Noble's share, Codex says Walmart has about 4.2 percent of the new book market, tied with the category of independent booksellers, which after a period of decline are staging a comeback. The downward spiral of large-scale book stores has been "a long pattern developing from the late 1990s, when both Border's and Barnes & Noble were equally winning from opening up new stores every year at the expense of the independents," Mike Edwards, Borders' last CEO, said. "But I don't think anyone knew how big a threat Amazon would be at the time." Borders was forced into bankruptcy in 2011. More recently, however, analysts say Barnes & Noble has struggled from perhaps innovating too much. It's tested restaurants called "The Kitchen," but the concept proved too expensive to grow at scale. It still has just five of these eateries, offering $12 avocado toast and $16 brisket burgers. "The top line on our restaurants is good. The bottom line is awful," Riggio said on a recent earnings call. America's independent book chains, meanwhile, are gaining their footing again by sticking to what's simple and what they know best — selling books. There are still more than 2,300 independent book stores in the U.S., according to the American Booksellers Association. And speaking to the power of the store — Amazon has opened 18 across the U.S., according to its website, with plans for more. "This is a very fragile industry now," Codex Group CEO Peter Hildick-Smith said. "Our data is suggesting a lot of the books business today is behind the Amazon curtain." He said more than two-thirds of all books sold on a unit basis are now transacted online. Taking note of this trend, Riggio has said investments online will be the company's next priority. Still, he explained, "the magnitude of what the Amazons and the Apples and the Googles can achieve in terms of technology is so far beyond that which we could achieve, we've really got to carve out a space for ourselves. ... We can't do it all." Another area the company still needs to compete on is price. A copy of new release "Diary of a Wimpy Kid: The Meltdown" by Jeff Kinney was recently for sale for $8.96 on Barnes & Noble's website, but was $8.37 on Amazon, for example. Aside from Amazon, there are plenty other challenges. Many of Barnes & Noble's stores today are situated in suburban shopping centers, where foot traffic has fallen off. Further, if customers do walk through the bookseller's doors, many funnel into its Starbucks coffee shops without making other book purchases. "The foot traffic in the coffee shops used to match that in the stores," said John Tinker, a senior media analyst at Gabelli & Co. "Now the foot traffic in the coffee shops is more than the stores." Riggio, now 77, acknowledges this issue. "The stores we've built over the many years have kind of followed moves to the suburbs and exurbs," he said. "Now we see America is moving from those areas back to inner cities and main streets." With 630 locations as of the end of fiscal 2018, Barnes & Noble's strategy has been to shut some of its larger locations (roughly 30,000 square feet) in favor of opening smaller shops (some as small as 8,000 square feet). Five prototype locations that will condense book selection to focus on educational toys and games are planned to open this fiscal year. Activist investors all along have seen Barnes & Noble's setbacks as opportunities. In July 2017, Sandell Asset Management tried to take the bookseller private. The firm, which held about a 2.75 percent stake in the company at the time, called Barnes & Noble's real estate "beachfront property," adding: "What makes the under-valuation of Barnes & Noble all the more shocking is that, as opposed to the numerous other national apparel, footwear, grocery, and home furnishing chains abounding in this country, there is but one truly national bookstore chain." Sandell went on to propose a deal valuing Barnes & Noble at around $650 million, or $9 a share. But Riggio soon after stepped in and said he didn't think the deal was "bona fide," considering Sandell's stake in the chain and the extra financial backing needed to make it work. Then, the past September, activist investor Schottenfeld disclosed a nearly 7 percent stake and pushed the board to explore strategic options, which is underway. Like many of its critics, Schottenfeld has said Barnes & Noble needs to do a better job of converting visitors in stores to paying, and even loyal, customers. Sandell and Schottenfeld didn't immediately respond to requests for comment. Though he's made a name for himself in retailing, Riggio has been criticized for not wanting to let go of the business that he built from a flagship store on Fifth Avenue in New York in the 1970s to what it is today. In 2016, he said he was retiring from day-to-day tasks, but he's still in the mix. And some of that is because former CEO Demos Parneros was let go in July for claims he sexually harassed a female employee. In a complaint filed after he was let go,Parneros said an unnamed "book retailer" was nearing a deal this summer to buy Barnes & Noble. Barnes & Noble then rebutted that Paneros "intentionally sabotaged a potential acquisition of the company." The Wall Street Journal said the unnamed retailer was W.H. Smith, based on conversations with people familiar with the situation. W.H. Smith didn't immediately respond to CNBC's request for comment. Edwards said Riggio should always have "an iconic place at Barnes & Noble." However, he said, "the new CEO coming in has to have more of a transformational background" and lead it through a much-needed turnaround. It was Riggio who took Barnes & Noble public and became CEO in 1993. He held that position through 2002. During that time, he launched its website and built out a book database online. The CEO title was then handed to his younger brother, Stephen Riggio. Since his departure in 2010, the company has had four CEOs, all but one of them were promoted internally. Publishers and investors have been disgruntled by the shakeups, saying it's leaving Barnes & Noble with little direction and no clear path forward. "I'm not looking to secure a legacy, you know, I'm just looking to do as much I can to see this company be successful," Riggio said. "It's a huge responsibility considering I've been doing this for more than 50 years."